A Toyota Camry suffers serious damage after a suspected hit-and-run accident in San Jose (September 11, 2016). 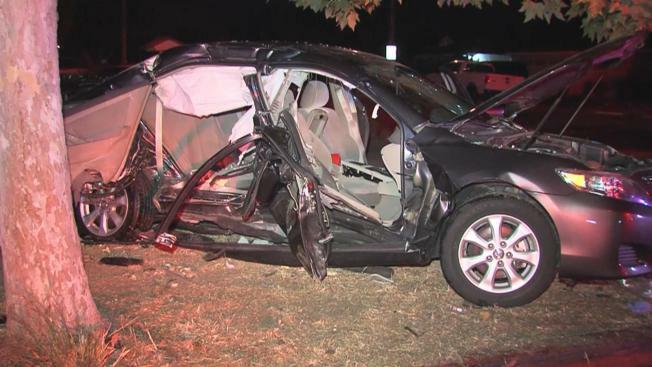 Three people suffered major injuries after being tangled up in a suspected hit-and-run accident in San Jose overnight, according to San Jose Fire Department Capt. Mitch Matlow. Emergency crews responded to the scene of Alum Rock Avenue and Pleasant Ridge Avenue just after 1 a.m. to find three people trapped inside of a gray Toyota Camry that had been struck by a gray SUV, Matlow said. After a 35-minute-long rescue attempt, the driver and two passengers in the Camry were extracted and transported to a local hospital to be treated for major injuries, Matlow said. There conditions were unknown. The driver and passengers from the SUV fled the scene, Matlow said.